With a potentially monster storm approaching the U.S. East Coast just days ahead of Halloween, it's not surprising that weather forecasters have dubbed the intense Hurricane Sandy a "Frankenstorm." But there may be a better name for the incoming hurricane, NASA officials say. Hurricane Sandy is currently a Category 1 storm on the Saffir-Simpson wind scale as it creeps northward in the Atlantic Ocean. The storm is expected to merge with another cold front early next week and could transform into a powerful hybrid tempest, according to the National Hurricane Center. "Some forecasters are calling this combination of weather factors 'Frankenstorm' because of the close proximity to Halloween," officials with NASA's Goddard Space Flight Center in Greenbelt, Md., wrote in a storm update today (Oct. 26). "However, because Sandy is a woman's name, the storm could be considered a 'bride of Frankenstorm.'" As of this afternoon, Hurricane Sandy was about 430 miles (695 kilometers) south-southeast of Charleston, S.C., and 30 miles (50 km) north-northeast of Great Abaco Island. The storm had maximum sustained winds of about 75 mph (120 kph) and was moving north at about 7 mph (11 kph). Hurricanes and other major storms have names that progress in alphabetical order and alternate between the male and female genders. The storm before Sandy was called Rafael and the storm that immediately followed the "Frankenstorm" was named Tony. The next major Atlantic storm to carry a female name will be called Valerie, according to the current cycle. Names beginning with the letters Q, U, X, Y and Z are left out of naming convention due to their limited number. NASA and the National Oceanic and Atmospheric Administration (NOAA) are keeping constant watch on Hurricane Sandy using satellites that monitor the storm non-stop with radar and in visible light and infrared wavelengths. NASA's Tropical Rainfall Measuring Mission satellite has revealed spots of intense rainfall around the storm's center, Goddard officials explained. "Storm surge is expected to be [a] big factor as Sandy approaches the Mid-Atlantic coast. 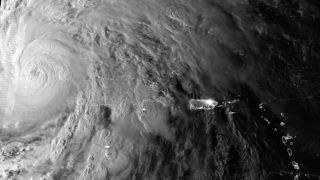 Very rough surf and high and dangerous waves are expected to be coupled with the full moon," Goddard officials wrote. "The National Hurricane Center noted that the combination of a dangerous storm surge and the tide will cause normally dry areas near the coast to be flooded by rising waters." NASA is providing constant updates, interviews and video to the public via its hurricane status website here. The term "Bride of Frankenstorm" was proposed by Goddard's Rob Gutro, Hal Pierce and Marshall Sheperd during today's updates.